The JPX Cobra 450 is a hand-held, pistol-style device that fires a polarized and concentrated stream of oleorisin capsicum (OC) solution. The solution is basically a mixture of cayenne pepper and water. The natural ingredients make the JPX Cobra 450 a truly non-lethal device. The difference, according to Tulia Police Chief Jeffrey Yarbrough, is found in the Scoville heat units. A jalapeno pepper is measured at around 8,000 Scoville heat units, while the JPX Cobra 450 OC spray is measured at 400,000 Scoville heat units. Yarbrough explained that, “the OC spray from the JPX will certainly overload your senses but water, air, and time is all it takes to neutralize the effects of the spray.” Another impressive quality about the JPX is that each stream of OC spray travels at around 405 miles per hour and has been tested at 30mph crosswinds. 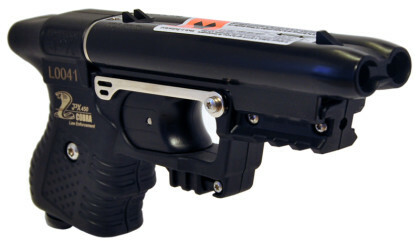 The attached laser sight adds to the pinpoint accuracy of the device. The Tulia Police Department currently has two JPX Cobra 450 certified instructors to provide officers with specialized training into its use, effectiveness, and safety. Tulia Police officers will begin carrying the device by May 30.